In her book, Keyes shares the perception that anything with Snickers is inherently more “blokey,” or in American, man food. That’s fascinating, because I have never really thought of Snickers as being masculine. I mean, it’s chocolate. Don’t we girls have the monopoly on that? Or does the darker packaging and no-nonsense design scream “male?” It’s a thinker. Whenever I think of food, I kind of gender assign it. Maybe that’s a bad idea, but the whole stereotype of women liking chocolate and men guzzling beer has held up with a lot of people I know. Which, of course, begs the question: if we hadn’t been raised to like certain foods over others based on our gender, would our tastes be different? If I hadn’t been indoctrinated into chocolate early on, would I be more inclined to skip dessert and just eat a hunk of red meat the size of my head? Last week, I read three blog posts in a row that involved steak. Suddenly, I couldn’t take it anymore. I stopped at the grocery store on the way home (a much-hated errand after a long day at work) and picked up a steak. Just for me. Everyone else got hamburgers. And eating that steak was so satisfying that I had to wonder: would I miss the brownies if I just ate like a man? It’s a complex question, and one that I wonder about a lot. Because it’s not like men don’t like their brownies. And I think that after about three days of steak, I’d go running back to the Reese’s with nary a second glance behind me. Sugar addiction might be a serious problem, but I’m not willing to detox yet. Especially if I’ll go running straight from sugar to cholesterol. Besides, if you can’t eat like a man, work out like one. I’ve been a strength training convert for two years now, and I’ve never looked back. It’s the answer to so many questions about fitness and health. And Snickers is not. But hey, that shouldn’t stop any of us (male or female) from indulging. And since Snickers have all those peanuts, it’s protein for after a strength training workout. If Snickers really are candy bars for men, maybe that’s why some of them are so buff! This recipe threw me a little, because the original calls for a combo of ricotta and mascarpone cheeses. On the day I went shopping, there wasn’t any mascarpone at the grocery store, so I bought cream cheese instead. The ricotta is grainier in texture, so I wasn’t sure how I’d feel about the final result. But really, it came out nice and creamy, even though the texture is not what a traditional American cheesecake calls for. The other question mark for me in this recipe was the baking time. The recipe wants the cheesecake to bake for an hour and half at 325, something that I didn’t have time for. Apparently, baking it at a lower temp will make the top caramelize more. Since I wasn’t able to try that, you’ll see that the recipe below has a higher cooking temp with less cooking time. It’s all about tinkering! Once you cover this cheesecake with caramel sauce, it’s a sticky delight. I can’t believe this is my first cheesecake loaf, but it won’t be my last. And I plan to taste-test it among men and women alike to see how “blokey” it really is. Thanks for the inspiration, Marian Keyes! Preheat the oven to 350; Line a loaf pan with aluminum foil, leaving enough to hang over the sides of the pan. Coat with cooking spray. Set aside. In a microwave-safe bowl, melt the butter and chocolate chips for one minute. Stir until smooth. If needed, heat an additional 20 seconds before stirring again. Add the brown sugar and graham cracker crumbs to the melted butter and chocolate mixture. Stir until the crumbs are moistened. Pack the crumbs evenly into the bottom of the prepared loaf pan. Bake for 15 minutes. While the crust is baking, make the filling. In the bowl of a stand mixer, beat the cheeses and sugar until creamy. Add the eggs, one at at time, stirring after each addition. Add the sour cream and mix until smooth. Chop the Snickers bites in half. Fold them into the cheesecake batter. Pour the batter into the loaf pan. Bake for 40-50 minutes until the top is set. Turn off the oven and open the door. Allow the cheesecake to cool slowly. Remove the cheesecake from the oven and cool completely. Transfer to the refrigerator and chill overnight. When ready to serve, use the overhanging foil to remove the cheesecake from the pan and place on a platter. Drizzle the caramel sauce over the cheesecake. Sprinkle the peanuts over the caramel. Cut into slices and serve. Store chilled. This has been on my baking bucket list for a while. It’s fun to cook with cola. Did you know that cola makes a fantastic marinade for a hunk of beef? And it also makes a great cake ingredient. It just took me a while to get to trying the whole thing out, since we don’t keep soda in our house. More on that in a moment. Instead of using straight-up cola for this cake, I used black cherry soda. Dr. Brown’s, to be specific. If you’ve never tried Dr. Brown’s black cherry soda, you are definitely missing out. Their cream soda is pretty amazing, too. But that’s neither here nor there. This cake, though? This cake is amazing. And the icing on top ain’t half bad, either! Wow! 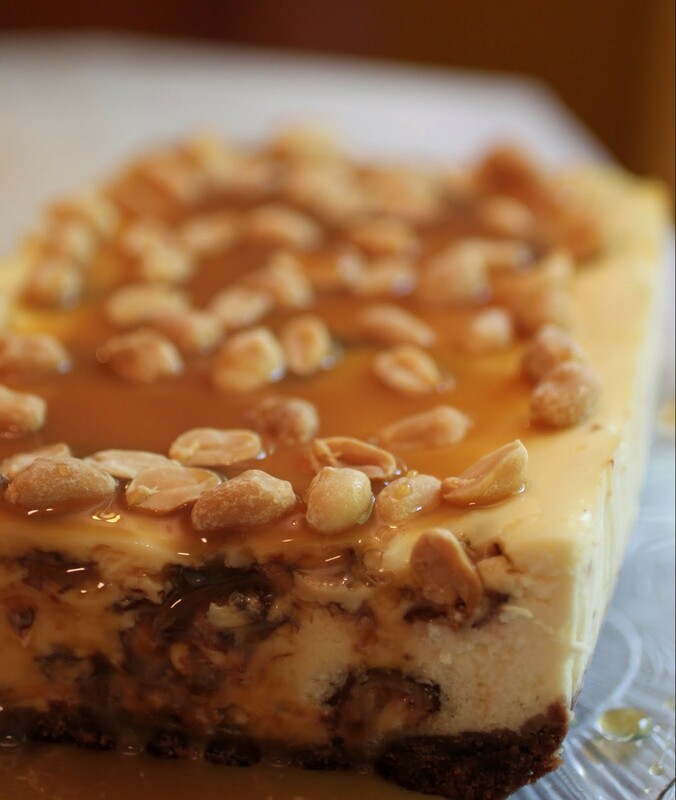 This snickers cheesecake loaf looks and sounds incredibly delish, Mir! I never knew that cheesecake could be made into a loaf, either! This is brilliant! 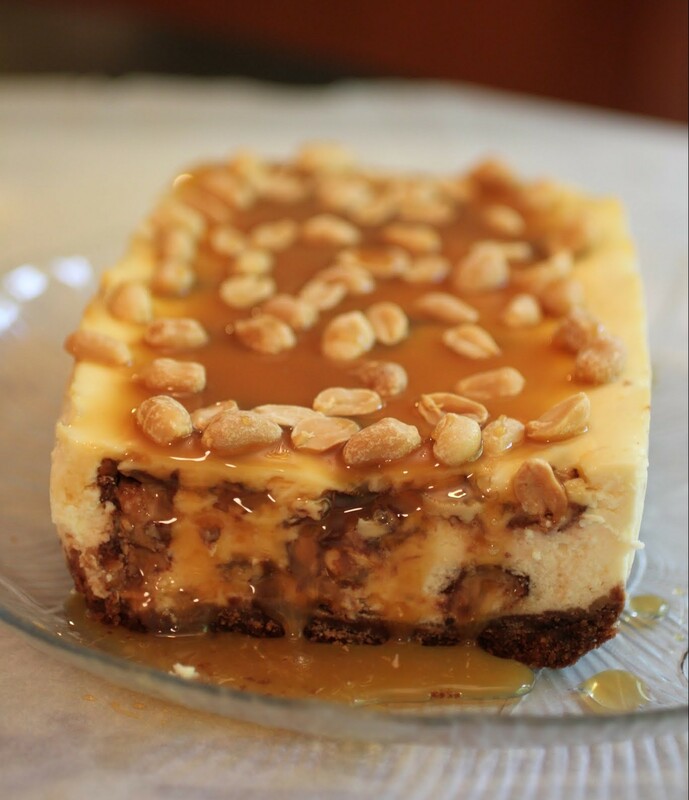 I’m loving the idea of snickers cheesecake. 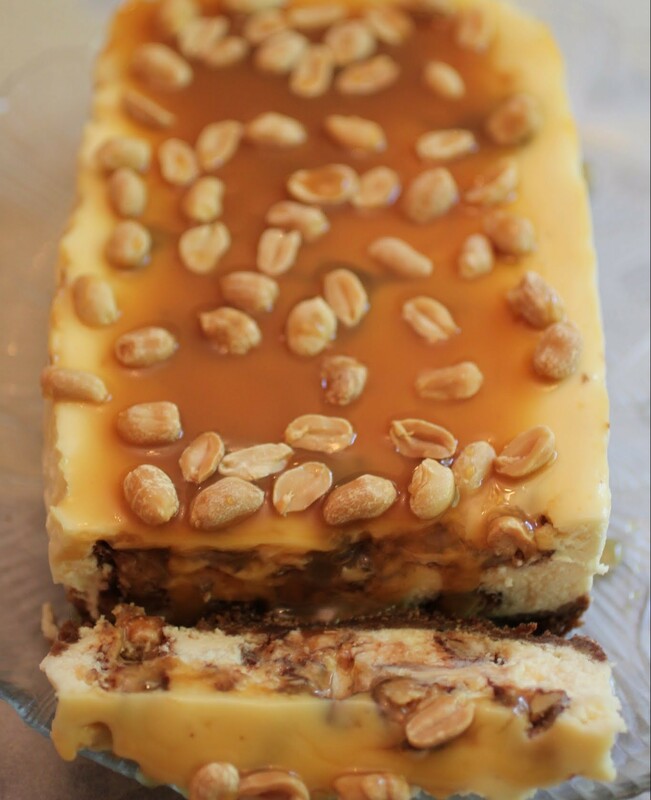 Especially with that caramel drizzled on top…yum! It is so much easier to do a loaf than a spring form, Gayle! Uhm, yea. I had NO idea that you could make cheesecake in a loaf pan!! Brilliant!! A good twist on the classic round shape, and it looks divine! I learn new stuff every day, Heather! It’s a process. Thanks! A cheesecake in a loaf? Say what?! This is a great idea, Mir! Thanks, Jen! It’s a really fun baking book. I recommend! Oooh, which one, Sina? Now I’m super curious! 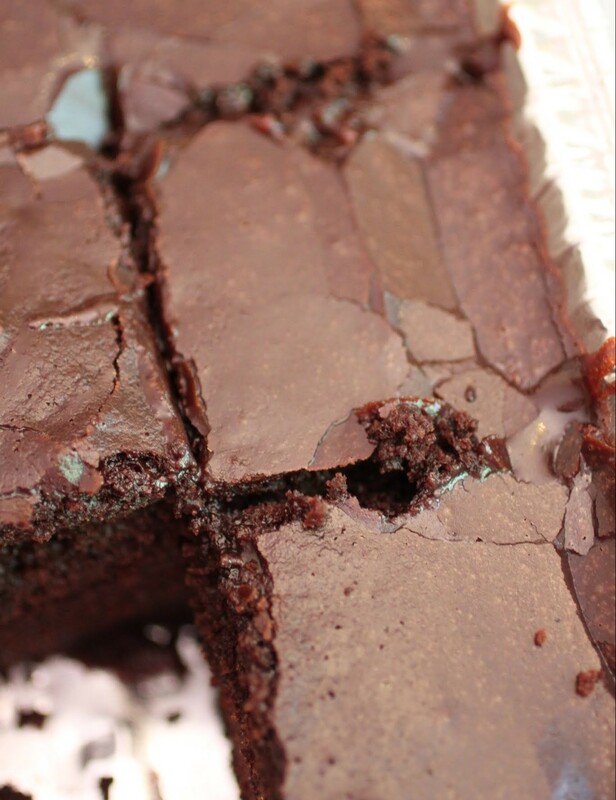 I would totally miss brownies. I mean, that would be a HUGE loss. You’re a good wife to make stuff for your husband that you can’t eat! I’m not that nice. 🙂 I don’t give up the remote, either. Thanks, Cheyanne! 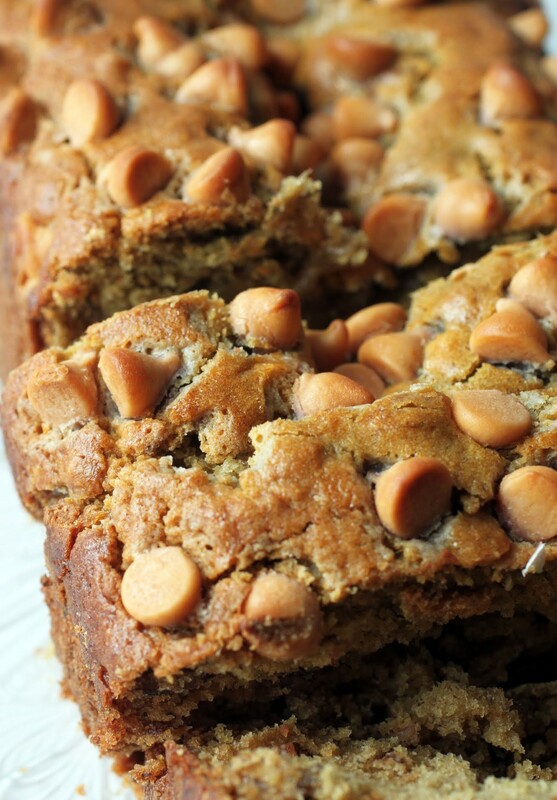 Snickers cheesecake loaf?! Pure. Genius. Thanks, Jennifer! I wish I’d thought of it first! I love this whole idea of making a cheesecake loaf! So fun! looks delicious Mir! Thanks, Manali! It’s an easy way to do it, for sure! I love a good chick lit read! 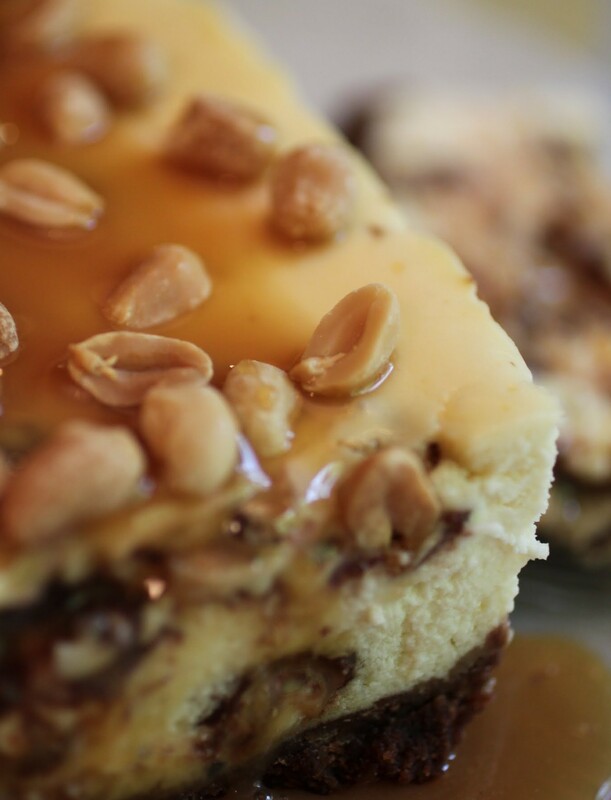 Who knew you could make a cheesecake into a loaf and adding snickers was a genius move! I’ve never actually considered gender assignment with food, but that’s something to ponder. I find it hilarious that you bought yourself a steak and fed the rest of your family hamburgers! Good job! Thanks, Rachelle. I’m Mean Mommy sometimes. My kids don’t appreciate steak, and my husband’s not a red meat guy. But I’m not gonna give up the good stuff! This is a game changer. In a LOAF PAN!!?? Wow. Also, snickers. yes. And blogs do that to me too, but it’s not steak. I’ve bought impulse Nutella and cookies after reading blogs! Oh, I have definitely eaten or bought more impulse chocolate than steak. Last week was a total anomaly. But it felt good! I’ve never thought to bake cheesecake in a loaf pan, but that’s genius! You can just easily slice it off and eat it too 😉 Love that you made a snicker’s version, one of my favorites! Yep, it’s much easier to bake it that way. Less fuss! I love snickers, and it’s actually what my mum craved all the time when she was pregnant with me, so that is perhaps why I love them so much. Thanks, Dannii! 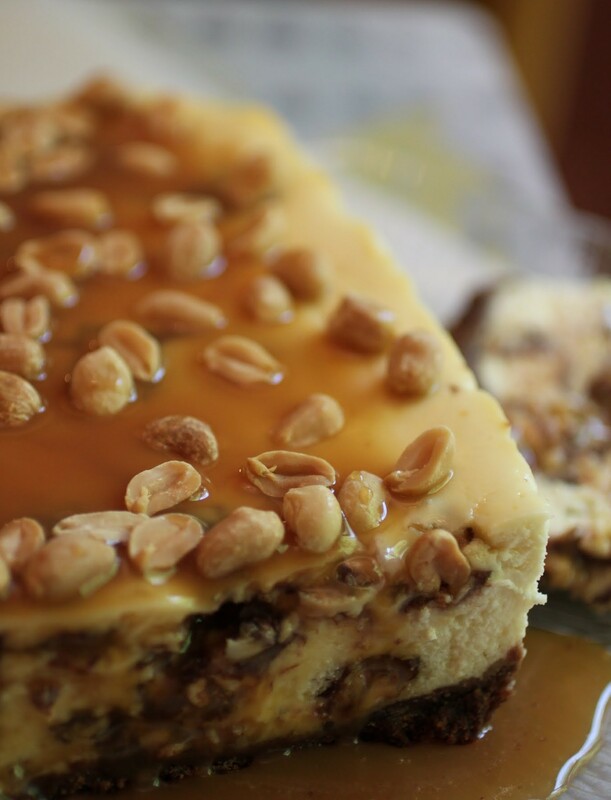 I’m always working on the pics…and yep, if your mom craved Snickers, you are totally wired to love them. My youngest had a pregnant mommy who couldn’t stop eating sweets, and she just wants dessert all the time. I feel bad about that. Cheesecake in a loaf pan sounds like a fabulous idea to me! Snickers are definitely for women. Like me! One of my favorite candy bars. This looks absolutely amazing! I don’t care whether if it’s for a man or woman, I know this is definitely for me! 😉 This looks sooo good! Good way to look at it, Jasline! Food is food. Thanks, Harriet Emily! I do love the Snickers, too. Makes me happy! Cheesecake in a loaf pan?! I love this! and so interesting about foods and genders. . I’ve never really thought about that but you are so right! and what do you do for strength training? I’m starting pure barre tomorrow! 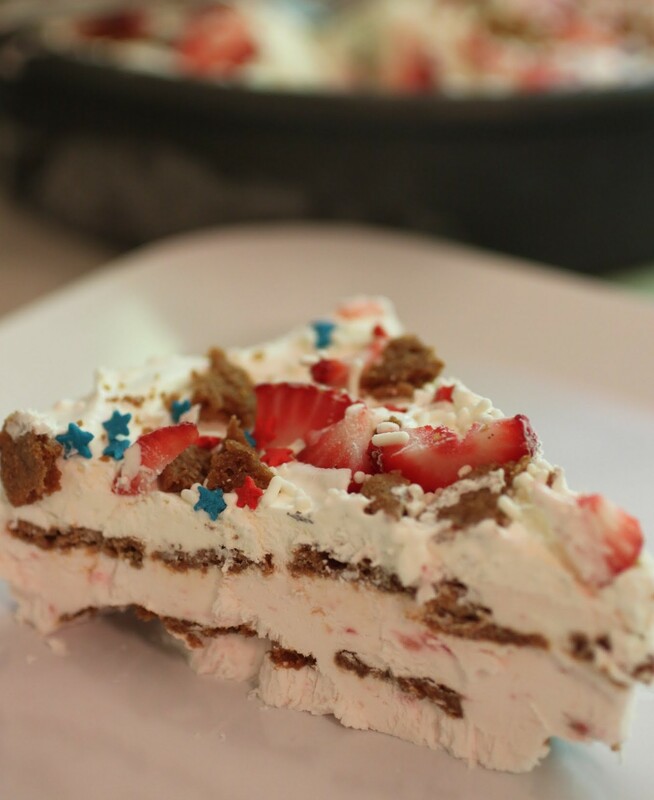 Alice @ Hip Foodie Mom recently posted…25 Sweet Treats + A $100 Ghirardelli Giveaway! So I’m also a barre girl, Alice. Physique 57 is my favorite barre class, but they’re all incredible. They give you lean muscle tone like nothing else. But it BURNS when you’re doing it! 🙂 Let me know what you think! Lol steak is definitely one of my happy places. I run from loads of sugar to loads of fat back to loads of sugar again. It happens. And it sure tastes good. Nope, never a bad thing when Snickers are involved. They’re my happy place! Cheesecake loaf???? How cool is that? I totally never would have thought to bake it in that type of a pan, but hey it works. 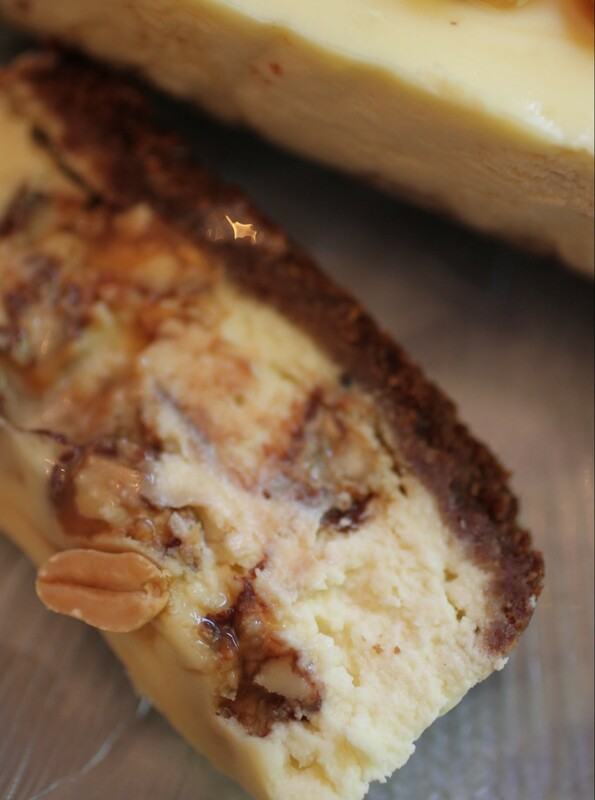 I love ricotta and cream cheese in cheesecakes…but I think it is a acquired taste. I just made one for my book and my hubby wasn’t a big fan of that one, but I loved it! And I know I would love this one covered in Snickers goodness!!!! You’re totally right about it being an acquired taste. I took the first bite and kind of lifted an eyebrow, but then my brain adjusted and I was cool with it!